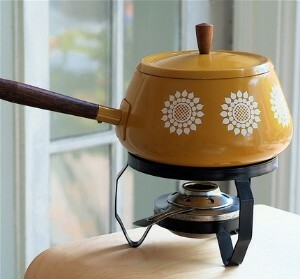 Sure, fondue is from the 1600s, but man, what a '70s dish that was. Our parents invited their friends over, and everybody gathered around their avocado green fondue pot, dipping bread into ooey, gooey cheese with one hand and puffing on a Pall Mall with the other. All the while we kids were peeking through the bannister, trying to figure out how to score an invitation to what was obviously the trendiest party in town. A food that blended molten-lava dairy products, long-handled pokey forks and giant chunks of bread? Yes, please! Why were we sent to bed after a dinner of a baloney and butter sandwich on Wonder Bread? Of course, by the time we were old enough to buy our own fondue pot, light the can of Sterno and watch as the cheese, white wine, garlic and kirsch all melted into one big bowl of gooey goodness, most of the magic was gone -- it was much more trouble than it was worth. But we'll always have our childhood memories of the smell of Swiss cheese, Sterno and smoke. Mmmm. Check out this great (although murky) clip of Mary, Rhoda and Georgette nibbling on fondue from "The Mary Tyler Moore Show"!